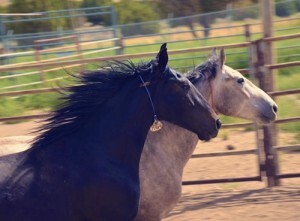 There are few horses more expressive, sensitive and hardy than America’s wild-born mustangs. To promote awareness and education on the versatility and train-ability of mustangs, Sage Creek Equestrian of Heber City, Utah, has partnered with the Bureau of Land Management to host the Ninth Annual Impact of the Horse–Two Worlds–One Event on Friday, Nov. 9 and Saturday, Nov 10, 2018, at the Wasatch County Events Center in Heber City, Utah. The competition will kick off at 10 a.m. on Friday with events including the Mega 100-Day Mustang challenge and the rugged mountain trail challenge where competitors in the domestic horse division will compete against the adopted wild horse division. The top five in each division will go on to compete in Saturday’s championships. On Friday afternoon and Saturday, eight youth and six adults will compete with 14 wild horse yearlings that they have taken from “wild to mild” in 100 days. The 100-day yearling competition will start at 3 p.m. on Friday. All animals competing in the Mega 100-Day Mustang challenge and the 100-day yearling competition will be available for adoption at 5:30 pm. on Saturday. Participants will compete for prizes and money that will be distributed to the top 10 finalists on Saturday. For more information about this event, contact Lisa Reid at (435) 743-3128, or visit SageCreekEquestrian.com. Follow the wild horses in training at: FB/Impact-Of-The-Horse-Two-Worlds-One-Event. For additional information about the wild horse and burro program, visit www.blm.gov or call the Utah Wild Horse and Burro Hotline at (801) 539-4050 or the BLM Utah State Office at (435) 743-3128.